Planning a vacation can be so much fun,..... unless you can't find the right condo for the right price. We hope your search ends right here. First off you are going to the beach for your vacation. Good start. The next thing is to find the condo that you and your family will enjoy for the entire stay and make you want to come back. We think this is it. Right here. We are vacationers too and we look for certain things. Cleanliness, cleanliness, good prices, convenient location, things to do, money left over for food, shopping, recreation and fun. We are sticklers for cleanliness and don't mind mentioning it more than once. Our condo is cheerful and inviting. Comfortable and peaceful. The perfect place to start each day of your vacation. Our complex have amenities right on the property to keep everyone happy. Playground, beautiful pool, mini-golf, basketball, shuffle board (shuffle board? ?, yep), grilling areas, picnic area under roof or in the open. Our condo is directly across the street from the beach. No long walk. You will be on the beach quicker than the folks in high rises waiting on elevators. You will be parking in the shade under your condo. No hot car and no search for your car. We have a convenient shopping/eating facility next door to Village By The Gulf. 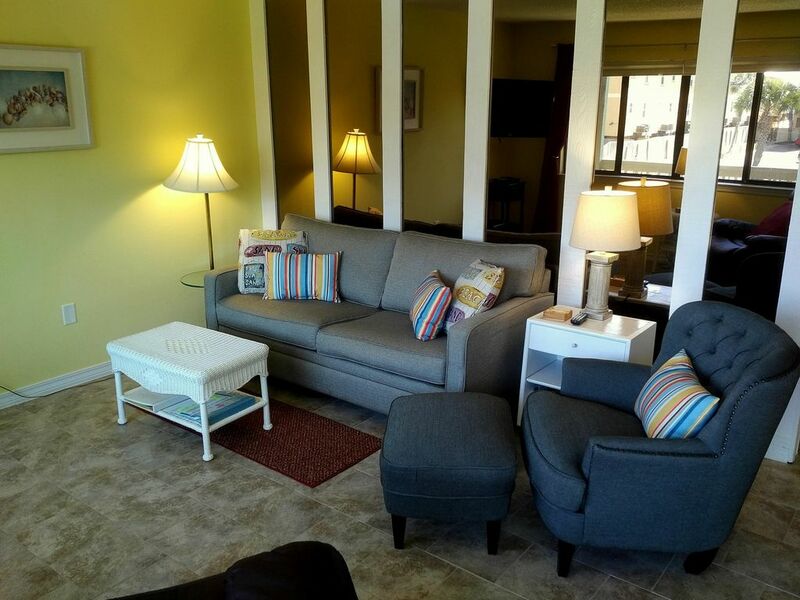 We hope you will love this condo and will create a memory every time you come. We'll leave the light on. We booked this unit the night before our arrival. At the last minute we decided to stay longer and this unit was available. Randy was amazing at communication and helped us to the unit ASAP since we were a mom and 2 kids and no car! The unit was clean and beautiful. The beds slept amazingly. All stocked . Right across from the beach and the restaurant, store and ice cream shop was super convenient for a family with no wheels temporarily. The office personnel were so nice and helpful. Unit is very clean and well stocked. Easy walk across the street to the beach. Bbq grills! Comfy beds. Easy to work with Randy. Love the location, amenities & that owner is always so quick to respond. Very clean and comfortable. From the very beginning of contacting Randy through VRBO until time to check out everything went perfect! Randy was very prompt with answering questions and responding to my emails. The property itself was exactly has what the pictures show! My family 4 were very comfortable and didn't have to worry about stepping on top of each other. A very short walk across the street and you're at the beach. From the front door you can see and hear the water. The cool breeze in the evening was nice too. I enjoyed sitting on the back porch soaking up the quiet and reading. The pool, putt putt and basketball court was also nice to use! In a short drive you can be in the tourist area with all the shops and restaurants. Drive a little further to Wal-Mart or Publix for everything you need. Forgot something? There a little store right next door to the property! If you want to just hang out on the beach or at the pool you do not have to leave the property. I loved the personal touch of a binder full of top places to visit or go eat. My family checked out some of them. One big convenience was the keypad on the door. While there are keys as well. Having a key code is a plus! My teenagers could go the room without having to worry about getting a key from me or my husband. It was our first time visiting Gulf Shores and it will not be our last! Looking forward to staying at Village By The Gulf again soon! We were very pleased with our stay. The condo was very clean as was the pool which was a nice bonus to have. Just a short walk to the beach and offers all the comforts of home. Would stay again for next Gulf Shores trip. Thank you, Randy and Lisa, for another great week here @ Village by the Gulf. My family and I were comfortable and everything we needed was available in the condo. I liked the new furniture and the addition of the memory foam mattress pads on the beds are great! Gulf Shores is a perfectly sized beach city. Not too big and not too small. Anything driven to only takes a few minutes. Gulf Shores provides wide lanes for walking and biking.